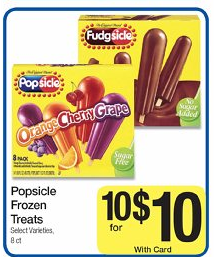 There’s a new $1/2 Popsicle coupon. Many Kroger stores (and affiliates) have these on sale for $1 right now. Buy two boxes and use the $1/2 coupon to get them for $0.50 per box. They were 4 for 5 at my kroger in Indiana. Hi everybody, I was wondering if anybody has seen the Popsicles that are naturally colored. I have been able to get these the last few years and my kids were so excited to have a snack that everybody else eats. However I’ve not been able to find them this year. Any ideas???? They will be .79 cents a box on Thursday at Ralph’s on Thursday! My Kroger doubles to a $1.00 so I can get 2 boxes for free.